A Day of Communication at GitHub. Chat and “Team”, a homebrew version of P2. Markdown for P2. Simple implementation, and does exactly what you need it to. Content is saved to the database as Markdown for better or for worse. P2 Resolved Posts is a nifty plugin we use at Automattic, in conjunction with the stellar P2 theme, to help better ensure decisions aren’t left hanging and things get done. This third release of the plugin allows you to register your own custom post states. The third argument is the position of the state. It can be ‘first’ or ‘last’, or ‘before’ => ‘state’ or ‘after’ => ‘state’. Alternatively, you can remove a state if you no longer find it useful. Getting this feature out the door required a fair amount of refactoring. It’s been running stable on WordPress.com for a couple of weeks — the most awesome way to beta test. Feel free to post any feedback, issues, feature requests, etc. 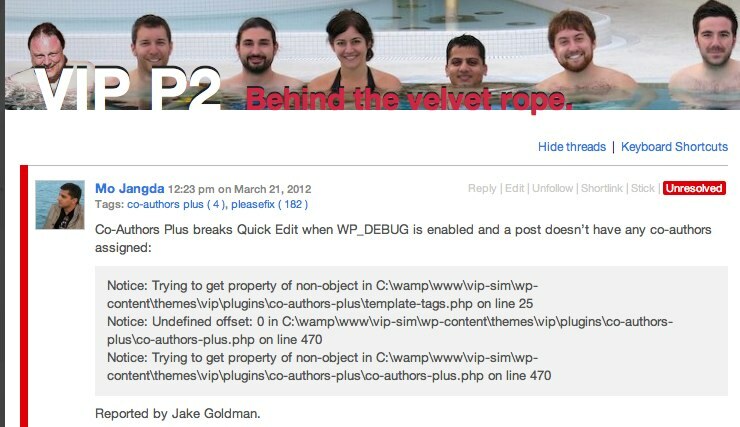 in the WordPress.org forums. You can also fork the plugin on Github. Automatically mark new posts as unresolved by adding add_filter( 'p2_resolved_posts_mark_new_as_unresolved', '__return_true' ); to your theme’s functions.php. Thanks macmeister for the request. Audit log records who changes the post state and when they change it. View the audit log by hovering over the action link. wp-cli command for the plugin includes a subcommand for programmatically changing the state of a post. Displays an error notice if you’ve activated the plugin but P2 isn’t the currently active theme. Fork the plugin on Github. In particular, I’d love to see an interface for assigning a post to yourself. Please post any feedback, issues, feature requests, etc. in the WordPress.org forums. Mark a thread as “unresolved” when the topic needs resolution, and mark it as “resolved” when you’ve achieved that state. There are also sidebar widgets to let you see all unresolved posts, optionally filtered to a specific tag. We use P2 extensively at Automattic, for a variety of purposes. I improved Nacin’s code last November because I wanted a simple way to encourage the culture of coming to a resolution on a topic. All too often, conversations are left hanging. This is a problem for those participating, and an even larger problem for those reviewing the conversation at a later date. The plugin is in-development on Github. Please post any feedback, issues, feature requests, etc. in the WordPress.org forums. Automattic has me spoiled. Today, I sat through an hour-long conference call and a two hour committee meeting. Let’s say an average of ten people were attending each. If each person makes an average of $30/hour, the conference call cost $300 and the committee meeting cost $600. And… the content of both was largely status updates. P2 needs a better marketing landing page so I can more easily sell it to every group I’m a part of. First work thread of the day quickly detoured into a conversation about the tool we were using to communicate. Win.